Horse Racing Deaths: Santa Anita Track Makes Changes The fatalities have forced the horse racing industry, and the public, to take a hard look at the sport and some of the issues that have been debated for years. In mid-March, U.S. lawmakers introduced a bill aimed at improving horse-racing safety by requiring a uniform anti-doping and medication control program. Medicating thoroughbreds has been a long-running controversy in the U.S. — some medications mask symptoms which critics say can lead to catastrophic horse injuries. Meanwhile, the Los Angeles County District Attorney's Office has assigned investigators to work with the California Horse Racing Board to try to figure what's caused the Santa Anita deaths. 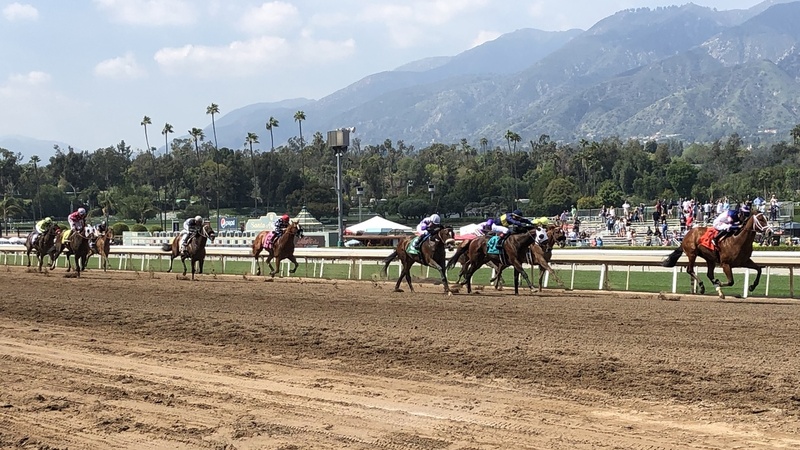 Amid the heightened scrutiny, and concerns about the racing industry's future, Santa Anita held one of its major events of the year this past weekend. At last Saturday's Santa Anita Derby, it was easy to see why the track, founded in 1934, is nicknamed "The Great Race Place." From the grandstand along the stretch, it was a visual feast. A bright blue California sky, the San Gabriel Mountains just beyond the Park, and muscular thoroughbreds rumbling by on the dirt track. Beneath this appealing, festive scene, though, there was anxiety among those connected to the track. Their mantra in the days leading up had been, "just get through Saturday." 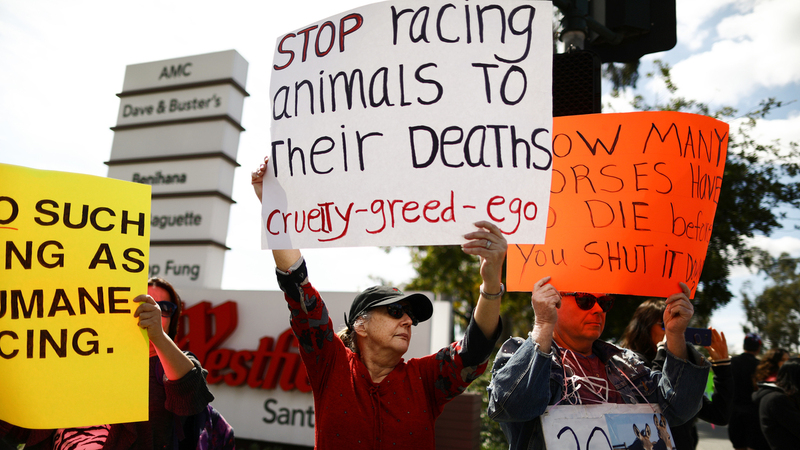 After 23 thoroughbred deaths, Santa Anita certainly didn't want another. Not on a day when NBC would broadcast the Derby, an important prep race for the Kentucky Derby next month. Top jockey Joel Rosario was focused on his racing, but still aware of the bigger issue. "Hopefully everything goes nice [and] smooth," Rosario said after finishing a race early in the day. "[Hopefully] we don't have any problem." Steve Bazela was among the more than 30,000 paying and gambling customers at Santa Anita on Saturday. He's been coming to the track since the 1960s. He certainly didn't want to see what he saw just a week before. The catastrophic injury to a thoroughbred named Arms Runner — the most recent horse to die. "All you got to do is see that once or twice in your life and it changes you," Bazela said. "I saw a horse break down at the finish line about eight years ago [at Santa Anita]. I just literally walked to the parking lot I was so upset. I mean, they give you everything they've got." Bazela is 65 and still loves the sport. But he did say the incident made him more aware of "why this is such a dangerous game. And it's not just the horses. The jockeys get on these horses and their lives are at stake." The big race of the day, the Santa Anita Derby, didn't disappoint. Horses trained by hall-of-fame trainer Bob Baffert finished 1-2 and qualified for the Kentucky Derby. Baffert, the face of horse racing in this country, was thrilled and grateful so many fans turned out and got to see an entire day of injury free racing. "We needed a lift," Baffert said. "I know I did." Catastrophic injuries happen in horse racing, but these spikes in deaths are not the norm. 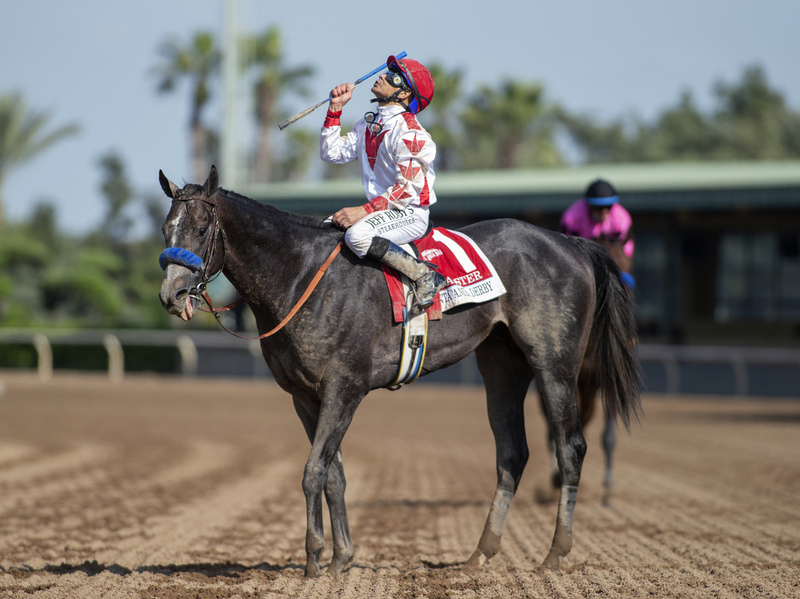 Baffert warned against over-reacting. "You don't have to burn the house down just because the pipes are bad," he said, adding, "we're going to work through this. But I really think the weather, really, caused a lot of this." You don't have to burn the house down just because the pipes are bad ... We're going to work through this. Baffert's not wrong. In January and February, southern California got a ton of rain. It affected the multi-layered dirt track at Santa Anita and posed a potential risk to the massive horses who need those layers just right in order to protect their legs. But, a prominent California equine veterinarian says you can't just blame the rain. "Frankly, we shouldn't have run on some of the days that we had a bad track," says Dr. Rick Arthur. "And some of the days when the track wasn't as good as it should've been, trainers shouldn't have trained their horses." Arthur is the equine medical director at the School of Veterinary Medicine at the the University of California, Davis. He also advises the California Horse Racing Board on veterinary practices, drug testing and health and welfare issues. He's been based at Santa Anita for more than four decades. Arthur says those decisions to race and train horses when the track wasn't in good shape, are driven by a reality that goes beyond Santa Anita to many of this country's race tracks. Where the focus, he says, is more on economics than horses. That, he says, is horse racing's real problem. "Racing has become more competitive over a period of time," says Arthur. "Horses are worked faster and there are fewer horses to fit the slots that are available. So there's more pressure on the horses to race more frequently." Getting the horse racing industry — track managers, owners, trainers — to embrace the ideas of less racing and more rest for the horses is going to take a culture change, Arthur says. But he adds if that doesn't happen, and horses keep dying at higher rates, there's a unanimous belief in what will happen. "If we don't make racing safer," he says, "I don't think the public's going to allow us to continue the sport." A more immediate, and perhaps easier fix to make racing safer is restricting use of medications for race horses. It's been a hugely controversial issue over the years and critics of over-medication point to what they call a more humane and effective use of drugs by the international racing industry. Recent changes at Santa Anita put the track more in line with international standards. The California Horse Racing Board approved proposals by track owner, the Stronach Group, to ban medications given to horses on the day they race – medications that can mask symptoms and thereby put the horse in danger of injuring itself. The 125-year-old Jockey Club, which registers all thoroughbreds in the U.S., supports the changes, and put out its own white paper in late March. The paper calls for comprehensive reform in the U.S. horse racing industry, and also focuses on medications and drug testing. Jockey Club Executive Director Matt Iuliano says his organization published a document in 2011 calling for reform of racing medication rules. It was similar to the new white paper. "We think the time is even more ripe now [for reform]," says Iuliano. It's something we should all worry about and make us have a singular focus. How do we improve the health and safety of that [horse]?" The last fatality in the spate of Santa Anita horse deaths, was on March 31. The weather now is warm and Dr. Rick Arthur says the track is in great shape. Along with the new rules on medication, more veterinarians have been dispatched to watch horses during training sessions. Even the industry's harshest critic, People for the Ethical Treatment of Animals, praises the ownership group's action. "As tragic as it sounds, it's a good thing [the spike of horse deaths] happened here," says PETA Senior Vice President Kathy Guillermo. "Where the company that owns the track is trying to make something of a difference." Guillermo says her organization started working on the issue of horse racing deaths a decade ago, but now senses people outside the industry are more aware. "What's different now," she says, "is we have a public that's intolerant of abuse. So it's getting so much more attention. It's long overdue." With the Kentucky Derby less than a month away, Guillermo says PETA is shifting its focus to Churchill Downs. Late last month, the Louisville Courier Journal described that famed racetrack as one of the deadliest in the U.S.
Guillermo said in a statement this week, "PETA is putting Kentucky on notice. No horses died during Santa Anita Derby weekend, which seems to show the track's new rules – while not as strong as PETA would have liked — are a lifesaving step. Churchill Downs has the second worst death rate for horses in the country. Change is overdue. It needs to come now." All those breathing a sigh of relief at Santa Anita know, however, it could be short lived. Until the next catastrophic horse injury. On the way out of the track this weekend, a visitor wished a steward good luck for the rest of this season. A steward enforces the racing rules at Santa Anita. "Thanks," she said. "We need all the good thoughts we can get."